Superheros often come with initiate or mutant powers, but some of our favorite comic book characters also rely on technology to save the world. Where would Batman be without his utility belt? Could Captain America really carry on without his shield? What would Iron Man be made out of without his life-saving suit? 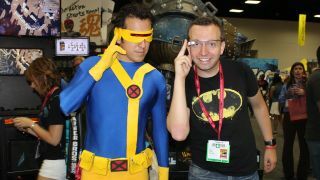 San Diego Comic-Con cosplay and exhibits are incorporating more and more technology every year, and we had a hand in introducing new gadgets like Google Glass to classic characters. While cosplay weapons are sometimes checked at the door and, apparently, a Google Glass ban existed at panels, here's what we found at Comic-Con 2014. I was able to step into the mind of X-Men leader Professor X this weekend thanks to an Oculus Rift and a pair of Beats headphones. Twenty Century Fox's booth brought the smart-minded superhero's brain amplifying mutant detector to reality, or at least virtual reality in a three-minute demo. It was used to pick out shapeshifting mutant Mystique from a crowd of innocent humans while looking 360 degrees in any direction. Looking down at Professor X's stationary wheelchair in real life and in virtual reality was the best part. I saw his hands laying on the chair's armrests, mapped exactly where my hands were. This worked well because the professor doesn't... exactly move much. The developers behind The X-Men Cerebro Experience could predict where my arms and legs were going to be. In fact, the only movement involved a tiny control stick on the right armrest that sent the chair in a limited forward direction and rumble technology that vibrated the seat intensely. All of this was captured by a GoPro 3 camera that Fox used to record each Oculus Rift demo, though the camera was often not working. That's what happened to me right before sitting in the chair. Warner Bros. showed me an even more action-filled Oculus Rift demo that sent me into the eye of a tornado with 4D weather effects inside a glass booth. This simulation promoted the studio's new Into the Storm disaster movie with the recreation of a scene that had characters hunkered down behind a sewer entrance. Through the first-person perspective of one of the characters, I saw the intense winds carry trucks into the barred sewer entrance until it gave way and underground pipes burst with water. Meanwhile, WB's two-person glass enclosure was filled with powerful fans that reproduced the wind effects that went as far as to send my badge flailing in the air. When Into the Storm premiers in August, it'll be one of the new 4DX movies that bring wind, smells and seat-rumbling effects to properly equipped theaters. Some people will do anything to go to San Diego Comic-Con, but one person in particular didn't even have to leave his Palo Alto office in order to roam around the show floor. Suitable Technologies CEO Scott Hassan had the most inventive cosplay outfits yet thanks to a steampunk version of his company's Beam remote presence robot. Hassan, an early Google architect, traveled the exhibitor hall without making the seven-hour drive and donned Google Glass. Best of all, his high-end video conferencing robot blended into the new Star Wars characters. This is the droid we're looking for. More Google Glass wearers could be found around the San Diego convention center on the faces of characters that would ask me for a demo. Game of Thrones' Jon Snow supposedly "knows nothing," but the HBO character sure knew how to work Google's wearable computer. Even though it should be old news to Back to the Future's Marty McFly, he seemed kind of excited by it. He was less excited by the already depleted battery life, however. We even paired up with X-Men's Cyclops to pretend to send some optical blasts into the crowd. The idea behind this was to eliminate sweaty nerds. It didn't work. It was surprising to see the excitement that the friendly Comic-Con cosplayers had for Google Glass. It was a much warmer reaction than I experienced at CES, which had a "been there, seen it, judged it" attitude.